Super Fast is a son of Super Bowl, out of Not So Fast, by Not Gunna and out of a Senator daughter. 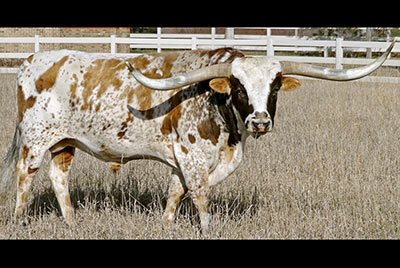 He offers a proven dimension in genetics for color, size, correctness and highly respectable horn. Although a large portion of his right horn has been broken, reliable sources calculate his tip to tip at 78" for a reconstructed measurement. This bull combines the correctness of Not Gunna, the flash and horn of Super Bowl and the thickness of Senator. He is a blend of excellent ancestry.